"This is not the time for my awakening. Something has gone terribly wrong." Lunar is the smaller of the two worlds in Dream Chaser's setting. It orbits Filgaia, and from the surface, it looks as its legends hold it once did: a crater-blasted grey world, lifeless and dead. This powerful illusion hides much about Lunar. Through the blessing of the Goddess Althena, the Silver Star rotates at the same rate as Filgaia (or the Blue Star, as Lunar's people call it), and is a verdant land. However, this world is gripped by a growing darkness that threatens to undo the gift of the Goddess. Thousands of years ago, when a great calamity wracked the world of the Blue Star, the goddess Althena lifted up her worshippers and fled to the nearby planet known as Lunar. At the time a lifeless void, Lunar was transformed by Althena's power into a verdant paradise, where the remnants of humanity could live and thrive under her divine protection. To aid her in her task, Althena granted fragments of her power to two races. The lesser are the Seraphim: a race of spirits charged with the protection of the borders of Althena's territories from monsters lurking in the void. The greater are the Four Dragons -- enormously powerful elemental creatures, second only to Althena herself in their might. While the Dragons are powerful in their own right, their main task is to choose Althena's champion from candidates among the mortal races. A mortal who completes the trials of all four Dragons becomes able to channel their power in defence of the Goddess. These Dragonmasters are the stuff of legends. In their absence, a new hero selected by the Seraphim arose, called the Shepherd. They clash with a recurring figure known as the Lord of Calamity. Now, the world trembles as the Church has declared the arrival of a new Lord of Calamity. But for the first time in a thousand years, a new Dragonmaster has risen... and given the people a reason for hope. For a more detailed history, see Lunar's timeline. Lunar is split into two known continents of approximately equal size -- Meribus and Glenwood. 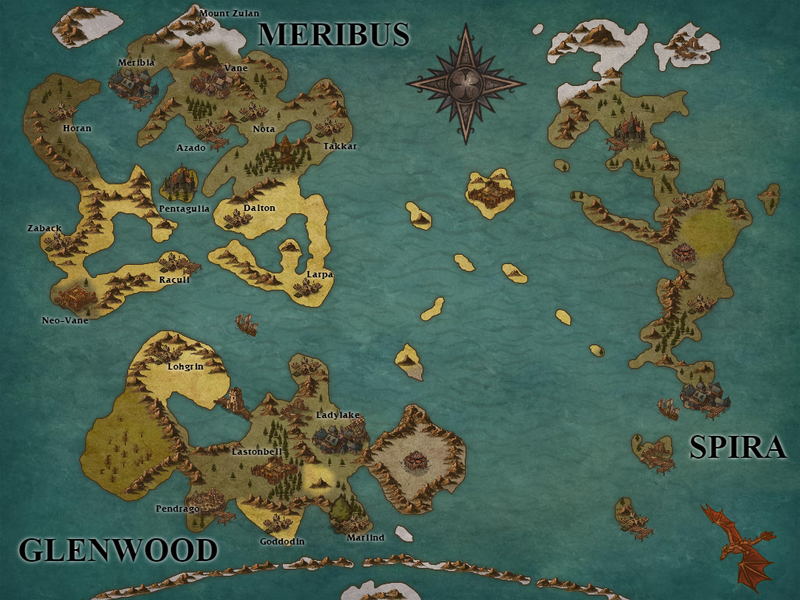 Meribus is fairly settled, while Glenwood suffers from occasional conflict and outbreaks of unexplained phenomenon, ranging from bouts of madness among men to extremely vicious attacks by wildlife. The two continents are separated by a short sea channel, and travel between the two is fairly common. Because calculations by scholars and sailors have revealed that Meribus, Glenwood and their littoral regions only cover approximately half of Lunar's surface, speculation abounds over the existence of a mythical third continent. Old sea stories passed down among sailors contain rumblings about strange vessels near the equator, or a mystical archipelago populated by friendly people and powerful sorcery, but any visitors to that land have evidently chosen to stay there. The name of this land, Spira, has entered the common parlance as a synonym for distant lands, exotic imports, and something few know anything about. Althena's Guard has been reformed into a more professional military, led by White Knight Leo. The Guard are actively patrolling out from Pentagulia, and banditry is decreasing rapidly in the inner continent. The Red Priestess Mauri is training a new generation of the faithful, and missionaries proclaiming the goddess's teachings are fanning out on pilgrimages. Blue Master Lunn has formed a fighting school in the city of Meribia, having displaced a cult that had killed the previous leadership. The Black Wizard Borgan has lifted a city into the skies, forming the Magic Guild of Neo-Vane. And finally, Althena has named the first Dragonmaster in a thousand years: the long-dead wizard Ghaleon, restored to life by the Goddess's power. As a result of these decisions, Meribian society is undergoing a revitalization, and support for the Church of Althena is at an all-time high among the commons (though a few whispers against the actions of the zealous faithful are beginning to emerge). The situation is more dire in Glenwood. The continent is roughly split between two factions -- the Rolance Empire and the Kingdom of Hyland -- that have clashed a dozen times over the past two centuries. The Church of Althena has been a moderating force in these conflicts, preventing border skirmishes from turning into outright war, but the Church's ranking priest in Glenwood -- the High Bishop of Pendrago -- has recently vanished without a trace. His interim replacement, Cardinal Runette Forton, is hard-pressed to keep Hyland and Rolance from each other's throats. Rumours abound that Cardinal Forton has petitioned Pentagulia to send Althena's Guard to keep the peace, but the Goddess thus far seems unwilling to do so. It is impossible to describe Lunar's culture without acknowledging the place of the Goddess Althena in society. While Althena does not demand prayer or reverence, every being living on the planet knows for a fact that Althena exists, and that they owe their life to the Goddess's mercy. While individual levels of piety can vary (particularly in Glenwood, which is far from the seat of the Goddess's power), gratitude bordering on veneration is the default setting for most. In recent years, the Goddess has once again taken a more active role in the lives of her people, including the naming of the first Dragonmaster in a millennium. Most view this as the beginning of a new golden age for the people of Lunar, but some of the edicts emanating from Pentagulia -- such as outlawing music, dancing, and drinking -- are causing quiet grumbling. The most common means of communication on Lunar is word of mouth, although in a far more organized form than on Filgaia. The Holy City of Pentagulia is in regular communication with its outlying branches, and priests and priestesses regularly pass the word of the Goddess down to their flocks. Aside from the Church of Althena, most large cities (such as Meribia) have some form of town crier, as well as a large message board in the marketplace where people seeking goods or services can advertise their desires. As Lunar does not have the technology to support radios, there is no in-character radio system on Lunar. As Lunar lacks any sort of mechanized printing, all written works must be copied by hand; this raises the cost of books beyond what most people can afford. Literacy levels are lower on Lunar than on Filgaia, though all PCs can be assumed to know how to read and write. The only other form of communication operating on Lunar are Goddess Statues -- brilliant white monuments to Althena found scattered across the planet. Every settlement has at least one (typically located in the Church), but they can also be found in forests, mountains, and outside ruins. The Statues have a calming effect on Althena's faithful, and travelers are known to camp near them. They can also be used to send messages to anyone known by the user -- simply touch the Statue, identify the recipient, and dictate the message. The Statues are connected to each other, such that next time the recipient accesses any Statue, anywhere, they will receive any outstanding messages. Goddess Statues and Memory Cubes are functionally identical, but do not connect to each other. In OOC terms, both operate through the MUSH's bulletin board system. Travel on the Meribus continent has become incredibly safe in recent years; Althena's Guard has scoured the region, putting down monsters and wiping out bandits and other ne'erdowells. While dangers still abound in ruins, forests, and swamps, most travelers can walk the roads in peace. The situation on Glenwood is much more dire -- even without the tensions between Rolance and Hyland, sightings of monsters with strange powers are increasing day by day. Most people do not stray far from their homes, and ensure they are behind closed doors well before nightfall. The foolhardy few who travel without armed escorts are generally not seen again. Horses exist on Lunar, but primarily in Glenwood, where they are almost exclusively used as mounts by the military and the nobility. In rural areas, cattle and oxen are typically used for plowing or pulling freight. The new Lord of Calamity, Lucia, appeared at the Blue Spire. She is being pursued by a contingent of Althena's Guard, led personally by White Knight Leo. The city of Meribia is enjoying incredible prosperity because of Blue Master Lunn, who has also cleaned up its criminal elements. Neighboring Neo-Vane has also seen incredible prosperity since its founding. However, rumors abound that the Black Wizard Borgan intends to completely replace Old Vane and its weakened Magic Guild in the near future. Rumors have spread from Glenwood that a new Shepherd appeared, after drawing the sacred blade in the Sanctuary at Ladylake, Hyland's capital. The Kingdom of Hyland and the Rolance Empire are moving towards war. Recent tensions have heightened, with both forces patrolling near Glaivend Basin. They have increased the number of knights there. Hyland's council maintains control of the Kingdom and the King. There are rumors about their corruption, especially on the part of their leader, Chancellor Bartlow. However, these rumors do not seem to slow Hyland's war footing or the expansion of the council members' personal wealth. Rolance has grown increasingly unstable. The death of the previous emperor has led to increased infighting between the Church of Althena and the Knights; the reigning emperor is still a child. At present, Cardinal Runette Forton -- already stretched thin by the disappearance of the High Bishop -- seems to be the closest thing to an authority in the Empire by default. Furthermore, constant rainfall has plagued the capital of Pendrago and the agricultural heartland of the Empire, which threatens the harvest. A comet was recently seen streaking across the night sky, to land upon the devastated world of the Blue Star. Since that time, there are growing reports of increasingly aggressive wildlife throughout Glenwood, as well as several unexplained disappearances across the whole of Lunar.